Today we’ll take a look at a homebrewing technique called the “blow-off method” or Burton Union System for improving your beer. The blow-off method removes proteins, tannins, grain husks, hops and other undesirable materials that tend to form at the top of the fermenter during the early stages of active fermentation. These materials are an undesirable byproduct of the brewing process, and float or get pushed to the top of the fermenter by carbon dioxide produced during the active stage of fermentation. These undesirables form a separate layer, called the ‘Kraeusen’ over the beer. We wish to separate these from the beer as early as possible because tannins, proteins, and other materials will contribute to cloudiness as well as add off-flavors to the beer. Many people use a secondary fermentation or conical fermenters to separate the beer from heavy materials that fall out right after active fermentation. The blow-off method attempts to remove lighter materials that float to the top of the fermenter as early as possible. I first read about the blow-off method in Charlie Papazian’s book “The Home Brewer’s Companion” (p 172), and have used it successfully for the last 15+ years. Commercial brewers in Burton-on-Trent pioneered the related Burton Union “blow-off” system over 200 years ago and have used it for popular styles like Bass Ale. Their system recovers some of the flocculent yeast from the top fermenting ale and reuses it for later batches. However, the blow-off method used by homebrewers merely discards the kraeusen. To use the blow-off method, you need a glass or plastic bottle fermenter of the same size as your target volume. A 5 gallon glass carboy is ideal. Next, procure several feet of 1″ inner diameter plastic tubing. The tubing should fit tightly in the top of the carboy. 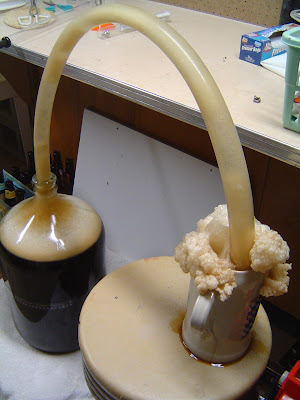 The method, as shown in the picture above, is to fill the carboy to the top when brewing and then use the large size tube to “blow off” the early foam and material that rises during active fermentation. A large container with water captures the liquid and material blown out of the fermenter and also acts as a giant airlock. Obviously you should use a much larger container for the overflow than shown in the picture, and also you should partially fill the container with water so the end of the tube can be kept under water forming an airlock seal. Leave this system in place for active fermentation during the first few days, and switch to a smaller airlock or secondary fermenter once activity has died down. You do need to be careful, however, as a smaller airlock will clog up if active fermentation is still ongoing. On one occasion, I switched the airlock before fermentation had completed and ended up blowing the stopper and airlock right off the top of the carboy. It was a huge mess. If you have a suitable 5 gallon carboy, give the blow-off method a try. You will be surprised how much debris collects in your overflow tank and not in your beer. I’ve been using this method since the early 1990’s with great results. Thanks for joining us on the BeerSmith Home Brewing Blog. Have a great homebrewing week, and as always please consider subscribing to the blog. Carpe Fermentum! I think that the author missed the mark. There is no proof that top fermenting kraeusen contains junk that would provide an undesirable off flavor brew as related by the numerous brew forums I reviewed. If memory serves me correctly, the Burton Union device was developed to collect yeast at high Kraeusen returning fermenting wort/ beer back to the main vessel. Go ahead and test the theory… brew two batches. I bet you will have a hard time discerning which brew was truly better. If you want to give the author’s method a try… please feel free to do so. I am pleased with the clarity and quality of my brew without complicating or subjecting it to needless potential exposure. There are those who do not secondary/ bright tank. This method of “collecting” may be beneficial to those who choose not to transfer off the yeast cake. Well, everyone has different opinions, but several authors including Papazian and John Palmer note that the tannins and resins at the top of the krausen can create astringent flavors that can be mitigated by skimming the krausen or using the blow off method described here. If you look on the web for terms like “skimming krausen” you will find quite a few references to this effect and technique. But as always – the beer is yours so brew as you like and enjoy what you brew. I’ve used the blow off method only for a few brews I’ve produced. I think I will try out your idea for a test Brewmeister. It should be easy to do a control test by brewing a small 2 gallon batch and splitting into two 1 gallon fermenters. A little less in the one which will not be using the blow-off tube. I’ll have to do the test and post the results on my blog. Not sure that the blow off method is a must if you want really good beer. There are homebrewers out there brewing great beers without it, even winning some contests I’d bet. Doesn’t the blow off method apply to mostly high gravity ales? I have been using the blow off method out of necessity, I only have 22 liter carboys so there is not enough space for the five gallon batch and active fermentation if a small airlock is used. I get quite a bit of blow off in the first 3 to 4 days, depending on the type of yeast used. My question is… Since ale yeasts are top fermenting is there any danger of too much blow off reducing the amount of yeast left in the carboy to ferment the beer? I have been using a blow-off tube since the second batch of beer I brewed about 5 years ago. I use it for all styles of beer that I make. I switch out a fermentation lock for a blow-off tube as soon as I see activity. I wouldn’t say it is a necessity, nor would I say that it’s harmful. I use 6.5 gal. carboys for primary, usually getting 5.5 gallons into the fermentor (1/2 gal. or so winds up as cold break, etc) so there is about a gallon of headspace. Not all of my beers krauesen the same. In fact, some do not even get high enough to reach the tube. However, when I recycle a yeast cake (very primitive, mind you. I just run my cooled wort into a carboy that I have racked the beer out of)I usually get a pretty “violent” fermentation within an hour or two. It is much more robust than pitching from a Wyeast smack pack, lots of krauesen travels through the tube and I find it almost a necessity when using this method. As far as blowing out too much yeast, I don’t think that it could ever happen. The population of yeast in the wort at peak fermentation is ridiculous. I would wager that you would have to blow out the whole batch (i.e. empty the carboy) for this to happen since if it is actively fermenting, the yeast has not flocculated. All said, I have never had (knocking on wood here) a contaminated wort by using this method. A friend that also brews with me does not use this method as much and I have noticed that we can both brew the same beer (splitting a 10 batch) and the one using the blow-off method seems to be a bit crisper and clears out a bit faster. This article is mistitled. There is no Burton Union in the photo, and the method described does not use a Burton Union. It’s just a generic blow-off method. Nothing wrong with that, but I am irritated to have an irrelevant article show up in a web search on Burton Unions. We have tried a similiar method using a bung, with a copper tube inserted into the hole of the bung and a plactic tube running out the top into a bucket with starsan solution. Seemes to work fine, but we only do it when we have filled the carboy up (just under the neck) and we have used an S04 yeast. Whenever we brew with so4 it seems so active that if we do not do this method we get a huge mess and blow off everywhere. The only concern I have is how do you get the blow off tube clean? we use the smaller tubeing and basically have tried soaking it in cleaner and starsan, and eventually just chucking it and using new tube everytime. This tube mentioned here is gigantic, and can’t be cost effecient to do it this way? just guessing though. I used to use the blow off method, but have since moved over to larger carboys and air locks. I find that a lot of the delicate hop aroma and some hop flavor is lost when the kraeusen is allowed to blow off a lot of its material.